It is just so simple I fail to understand how people do not get it. Well written article. 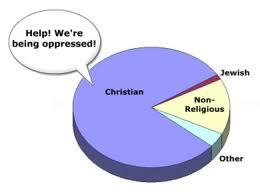 And I agree I hear about how we are "oppressing" Christians. How? By not allowing YOUR beliefs to deny MY rights? 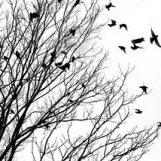 The false claims of persecution don't just involve legislation. They also involve the petty. 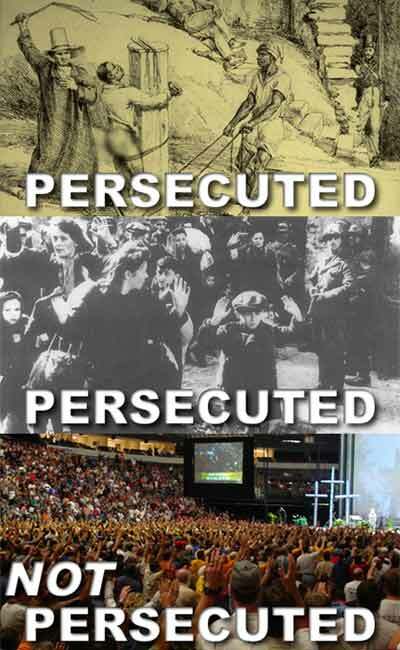 Unfortunately, believers eat it up because they desire to be persecuted. Perhaps certain groups and politicians are tapping into that desire. The root of the problem is the doctrine itself. Matthew 5:11-12 teaches that believers should revel at being persecuted, and that they will be rewarded in heaven for it. 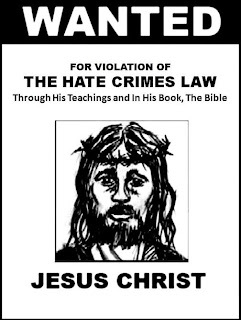 But Christians in the United States hardly have any legitimate complaints of persecution. I read a story recently about an Iranian pastor sentenced to death because he refuses to renounce his faith in Jesus. That’s persecution. A retail store printing “Happy Holidays” instead of “Merry Christmas” in its weekly ad is not. Yet many Christians in America become very upset over this kind of stuff. Frequently in email forwards and Facebook posts, I see statements like "Pepsi omitted 'under God' on a soda can." Or "the new U.S. dollar coins don’t have 'In God We Trust' on them." Or "U.S. radio stations banned the country song 'In God We Still Trust.'" It’s easy to verify that these stories are absolutely false. Yet they won’t go away. I’m most puzzled as to why these rumors are started in the first place. What is the possible motivation for creating this sort of misinformation? The only thing that I can come up with is that Christians want to feel persecuted, but those in the United States don’t have many legitimate gripes (which is good). So an indoctrinated need to feel persecuted fosters the spreading of these inaccurate stories. They don't care about the truth. If they think that they are being persecuted, pitchforks will be raised. Perhaps the conservative politicians and political groups are aware of this desire by the Christian majority to feel persecuted, and are intentionally tapping into it. 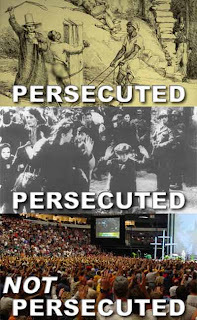 The Christian majority has an indoctrinated desire to feel persecuted. 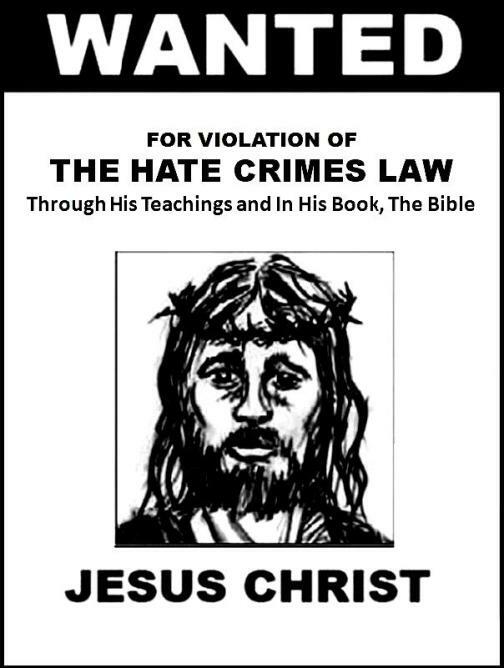 So they'll rally around someone claiming that Christians are being persecuted. And the truth does not matter, as evidenced by the spreading of untrue accounts of petty claims of "persecution" noted above. The promise of heaven is a pretty big reward and motivator, and blinds people to the truth. For centuries western thinkers avoided church persecution and prosecution by dint of sophisticated hypocrisy. Men as radical as Jefferson, James Madison, and Tom Paine opted for deism. An open atheist, then as now, would never be knowingly elected to public office. Atheists today are the most despised minority in the US, while xians play the old role of Roman oppressor. That believers must constantly come to the defense of god, yet god never reciprocates, is a pillar of my atheism.